The four plots marked in RED are our concern. The plot in the middle with the red circle is plot 5G - first to develop. The map is the current title map provided by the Dept. Of Mines, colour coded to portray relative amount of exploitation which has occurred. All blue coded plots are presently producing. 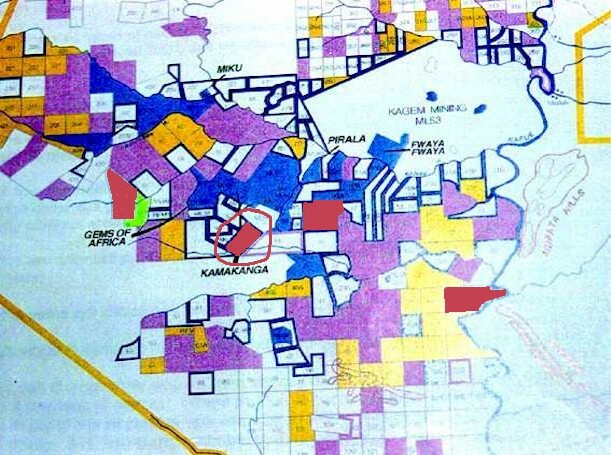 Blue outlined plots are holding or held mining licences in the past. A prospecting licence was once held on all plots coloured violet. No prospecting or mining licence has ever been applied for by the owners of yellow plots. No applicant holds/has ever held title to the uncoloured plots.